Those were more concentrated on Korean. But there are the Japanese and the Chinese ones. There is always a lot to say on this subject! Personally, I like Japanese soy, salty but with a slight sweetness. The Chinese ones light soy sauce don’t have that sweetness, I guess this is because most dishes add sugar in the recipes. Note that dark soy sauce (Chinese) is for colouring and not very salty. If you buy Japanese one, Kikkoman will do. Sometimes I use the Yamasa and recently I got an organic one. As for Chinese, I always try to get a Taiwanese one. If you like fish or seafood, you should get the Japanese sushi soy sauce or the Chinese seafood soy sauce, as they are less salty and better for dipping sauce. For Chinese soy sauce, Koon Chun. High quality, no artificial additives, and great quality. Do you need to store the bottle in fridge? Unfortunately, I don’t see this one selling in here. I do store it in refrigerator after open. What I do is that I partition small quantity in a small bottle near my stove at room temperature, the main bottle stays in refrigerator to preserve its flavor. OK, thanks, I will try to get a bottle when going to Hong Kong this year. My all purpose ss is Aloha Low Sodium. I love the dark mushroom flavor for hot and sour soup and also the rich deeper color. I also keep light, dark and other types on a shelf in the garage pantry. Meant to say I don’t know the brands of the other ones. Aloha has a regular full sodium which is also good if you don’t need to worry about the intake. That is it as far as I know, but Aloha does make a Hawaiian style Bbq and perhaps a teriyaki sauce too. Good products. For what it’s worth, here’s CI’s taste test results. I’ve seen a few other tests and Kikkoman generally seems to come out on top. My mom prefers some premium Korean brands like Sempio. I used to always get a bottle of Kikkoman and call it a day. On my mother’s behest I went with a bottle of low sodium last time. I don’t know why anyone would buy this stuff, it’s more expensive and you go through it so much faster. I only keep two bottles of soy sauce at home, a Japanese style wheat added soy sauce (like Kikkoman and other Korean/Chinese brands) and a Korean “soup” soy sauce which is wheat-free, soy only and used more as a salt substitute/umami addition in soups and stews. Any others I’ve found I don’t get enough use to be worth keeping. In almost all cases I think you can get away with just having one bottle of a good Japanese style product. Packed with flavor-enhancing umami, soy sauce is one of the oldest food products in the world. It originated in China about 2,500 years ago and made the leap to Japan around the seventh century. Over time, it’s been produced in a variety of styles and become a pantry staple worldwide; in fact, it’s the third best-selling condiment in this country after ketchup and mayonnaise. We feature it in all kinds of Asian dishes, but we also harness its savory flavor in recipes as diverse as barbecue, burgers, fried chicken, corn on the cob, vegetable soup, and lamb chops. 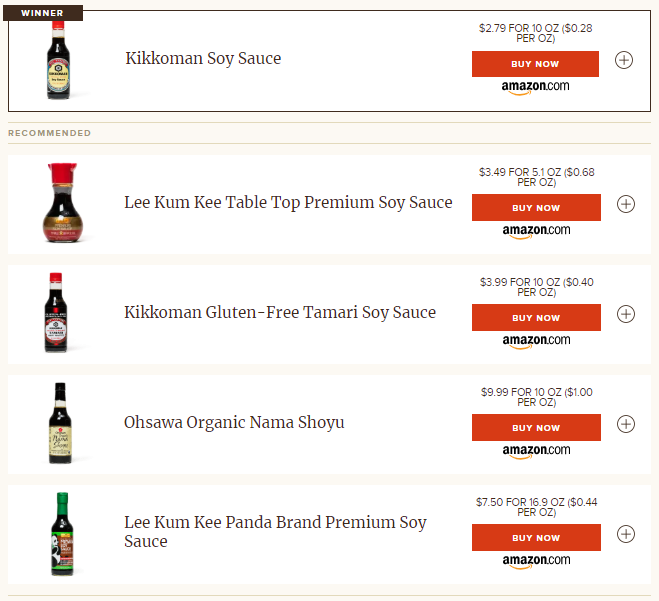 That said, we’ve learned over the years that not every bottle delivers the kind of nuance and balance that good soy sauce should, so we rounded up 10 top-selling nationally available products made in the United States, Japan, and China to zero in on a soy sauce worthy of being both a condiment and a staple cooking ingredient. Three were tamari, a close relative that’s made just like soy sauce but contains little to no wheat. We tasted them plain (with rice to cleanse the palate between samples) and cooked in a teriyaki sauce brushed over broiled chicken thighs. Tasters reported that they could not only taste but also smell distinct differences among the samples. Some boasted sweet-savory aroma and nuances like “caramel,” “vanilla,” “molasses,” and “honeysuckle,” while others not only lacked complexity but actually deterred us because they tasted “metallic,” “musty,” and “fishy.” Cooking them with strong aromatics like garlic and ginger muted those off-flavors enough that the sauces were passable, though ultimately they fell near the bottom of the rankings. As for the tamaris, two of the three were true failures; they tasted so harshly salty that we couldn’t recommend them. 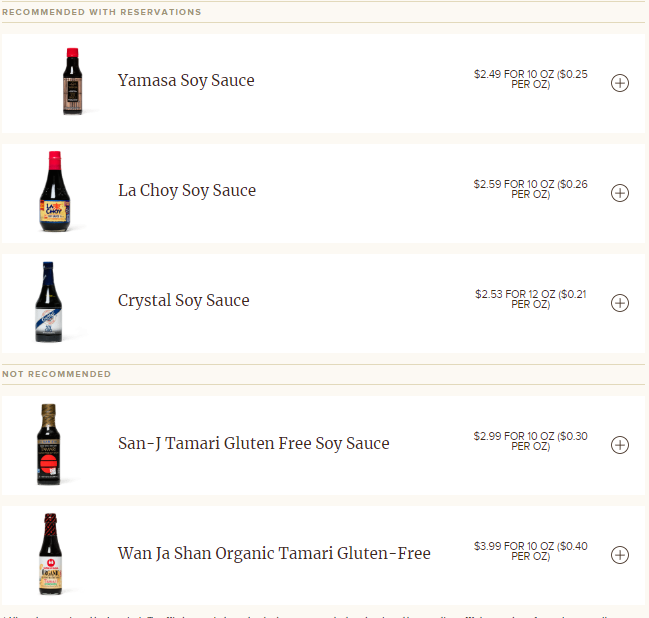 The third was an outlier that balanced salt and sweet better than many of the other soy sauces. We needed to look only as far as the processing methods for soy sauce to understand where those variations in flavor and complexity came from. Our results show a clear divide between those that were made according to a slower, more traditional method and those produced by a shortcut approach. The six top-ranking sauces we tasted are made the old-fashioned way: fermented, or “brewed.” The process starts by culturing boiled soybeans and roasted wheat with a mold that creates a mixture called koji, which functions like a sourdough starter: It begins to break down the carbohydrates and proteins and provides a sauce’s unique flavor profile. (Some manufacturers have used the same koji for decades or even centuries; Kikkoman, for example, claims that its koji dates back 300 years). From there, salt and water are added, and the mash, now called moromi, is left to ferment for anywhere from a few months to years. During that time, lactic acid bacteria work with yeasts to further break down proteins and carbohydrates into a mix of flavorful compounds (alcohols, esters, peptides, and acids), including glutamic acid (a major source of umami), and the clear-colored mash darkens to a deep reddish brown. Finally, when the manufacturer decides it’s ready—in our lineup, this period ranged from four months to two years—the mash is pressed to extract soy sauce, which is then pasteurized. The heat kills bacteria, stops fermentation, and launches the Maillard reaction, breaking down the proteins into hundreds of new compounds that give soy sauce rich caramelized flavor and aroma. The two lower-ranking soy sauces are made by hydrolysis, a process that takes just two to three days and involves no wheat or even soybeans, per se. Instead, defatted soy flour (or other flours, such as corn) is boiled with hydrochloric acid to separate the amino acids, which are then neutralized with sodium carbonate. The resulting hydrolyzed vegetable protein is doctored with caramel color, corn syrup, and salt to make it look and taste more like fermented soy sauce. We found these two hydrolyzed sauces, from La Choy and Crystal, passable—or at least pleasantly familiar—in the teriyaki sauce, where their “intense,” “deep and dark” flavors were not out of place and were balanced by the other ingredients. But when we tasted them plain, we picked up on “odd” flavors “like powdered beef soup”—not surprising, since hydrolyzed vegetable protein is used to create the savory, brothy flavor of bouillon cubes—that gave us reservations about recommending them as all-purpose sauces that might also be used as condiments. But what about hydrolysis makes it yield a less balanced and complex product than fermentation does? For one thing, the rapid and thorough protein breakdown. Research has shown that fermentation slowly breaks down proteins and thus allows them to develop multiple types of flavor compounds, whereas hydrolysis quickly converts all of the protein to amino acids, so the end result is relatively one-dimensional. The absence of wheat is also likely what accounted for the overly salty flavors we detected in the tamaris, all three of which are fermented products. We noticed that two of the tamaris contain an added sweetener to help balance the salt, though the evaporated cane juice in the losing sample couldn’t compensate for a saltiness so harsh that tasters’ mouths were “burning.” Fortunately, the sugar in the better tamari, from Kikkoman, made for a much more balanced product. Kikkoman is also the maker of our favorite soy sauce, which achieves good salty-sweet balance and plenty of complexity from its six to eight months of fermentation, one of the longer spans of our lineup. What’s more, it does so with just four ingredients—wheat, soybeans, water, and salt—whereas other recommended sauces add flavor enhancers and sugar to achieve a similar effect. Bottom line: You can’t go wrong as long as you buy a soy sauce that’s labeled “fermented” or “brewed,” but we’ll stick with Kikkoman’s simpler approach. I personally think soy sauce kinda ruins the taste of fried rice if used in any more than microscopic amounts. IMO to get the best fried rice flavor, your best bet is to go with with salt and msg. Only a tiny amount of soy if you prefer. Wow thanks so much for posting this! I use Kimlan mainly, which I think is Taiwan-originated. It seems to balance the characteristics of Japanese and Chinese varieties. But I haven’t made a close study by comparison. I use soy sauce very sparingly except in dipping sauces, where the original soy sauce is rather obscured by other ingredients. I agree. 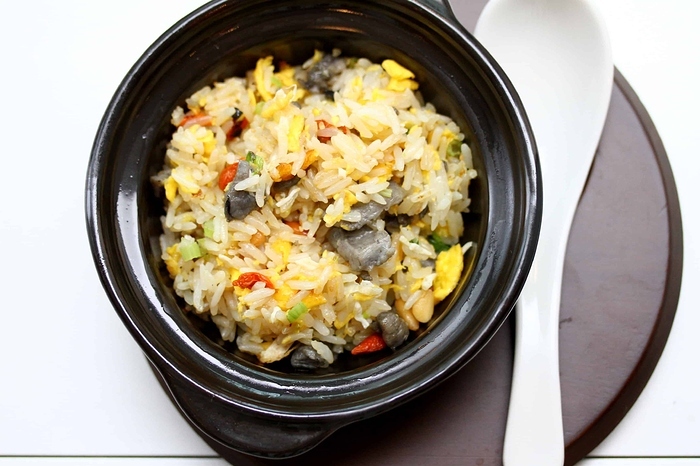 For most Chinese style fried rice (most), salt is need, but it is best to avoid sauce sauce. Yeah, no soy sauce, and adding MSG is the key to getting that proper Chinese fried rice flavor.